Memory is not really under our control. It is not something we can control nor is it something that we really own. It is only something that brings us together with people and it will remain that way. Thus pronounced Zainab Magdy on the stage of the Jesuites Centre in Cairo. The quote comes from a performance titled Ordinary People, written, performed, and directed by Magdy, and staged at the Jesuit Centre from 22 to 26 November. Ordinary People is the outcome of Hilfe das Volk kommt (Help! The People are Coming! ), a playwriting residency organized by the Literature Colloquium Berlin in partnership with the Maxim Gorki Theater and supported by the Robert Bosch Stiftung (Berlin). Magdy staged the play—a one-woman show— in Berlin in October, before bringing it home to an Egyptian audience this month. 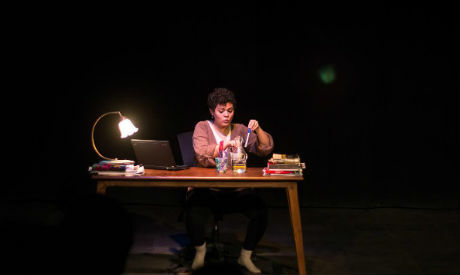 With a simple set of desk, small lamp, laptop, and a chair, combined with a screen in the back showing video art of scenes, and anonymous facebook posts that harmonize with the performance, Magdy fills almost 50 minutes with many stories and memories, transitioning smoothly between dreams and reality. We follow two parallel lines: Magdy's own history and losses, and those of others, which have merged somehow in Magdy's memory. "Part of my master's thesis was about collective memory. The issue of memory was always an interesting subject, but artistically I never thought this would be the topic of my first project. Over the course of a year, the subject arose as I went through several experiences, which contributed unconsciously to the project," Magdy told Ahram Online. An actress who works in academia on the side, Magdy graduated from the department of English language and literature at Cairo University, where she is also an assistant lecturer. She has been writing creatively and acting in independent theater since 2008. In recent years she has been part of writing workshops that focus on writing for storytelling and performance with gender sensitivity in mind, such as 'The Odd Ducks' Project. Earlier this year, she also participated in Zig Zig, a play directed by Laila Soliman that tells the story of 12 Egyptian women who were raped by British soldiers in 1919. Our minds separate our memories into jar-like compartments. These jars filled with memories are buried somewhere inside our mind in this thing called memory, and these jars will either remain or eventually break. "I started to hear so many details of Mostafa's disappearance, from different people. Although I never met him, his story weighed on my mind. Earlier, I had dealt with the death of a friend…she got Alzheimers before she died, and it was scary to me when she did not recognize me... I told her story in the performance. Then again, one morning when the director Mohamed Khan died, I felt that our life is desperate. I did not know him but he became part of my memory through his films, and by the memories of him in my friends' minds," Magdy recalls. In the performance, Magdy tells the story of a missing person, the details of which match the story of Mostafa Massouny, one of the most high-profile cases of alleged forced disappearance in Egypt, who went missing in June 2015 as he went out to buy food. His family said that they looked for him everywhere; in hospitals, police stations and morgues. Massouny, a graphic designer and video editor, worked for a private company before his disappearance. His family said that they found out through "different channels" that Massouny was being held by state security and that his release was imminent. The family's claims were denied by the interior ministry, yet one year on, Masouny's fate is still unknown. She went to sleep while peeling potatoes. She was going to make a potato casserole in the oven, Mostafa's favourite dish, with a kilo and a half of potatoes like she always did, always she peeled a kilo and a half, sliced them and lay them in the pan. She fell asleep with the potato skins lying around her on the sofa as she watched T.V. The way Magdy interweaves Massouny's story with her own personal stories about loss and memory is painfully artistic. It is the way we see his facebook posts on the screen without his name that heightens the feeling of loss, as if his name is being erased from our collective memory. The potato skins started twirling and turning into flowers: orange blossoms. The orange blossoms grew back into branches and the branches grew into an orange tree and the orange tree grew ripe oranges, ready for eating. She woke up and found her son sitting next to her, wearing the shirt and the pants he was wearing the day he disappeared. Magdy decided to write a blog post. When asked about the conceptual framework of the script, she said she was not thinking of certain concepts, but spontaneously connected the concepts of "memory," "loss," and "forced disappearance." She never published the post, as it evolved into the script she'd been searching for, for months. This has become her performance, an outcome of the writing residency workshop. "As a child, I used to go to Marsa Matrouh every year. After 8 years of not going, I went [there] on a writing retreat ... So many memories about my family returned to my mind there. Most of the memories I tell [in the play] are linked to that place," Magdy said. "I chose to write about the things that are settled in my memory, the gaps in the stories we have been told by our families and our friends, and their stories, which turn into our own memories. For me, memory is connected to loss, because when a person dies or disappears, what is left of him is what we remember about him," she observed. In 2008, I was 20 and I travelled for the first time outside of Egypt. For some strange reason, this trip slips from my memory, or I just don’t like to remember it. I only remember my friend's mother, with whom we were staying, telling me as a matter of fact that lower class people travel to Marsa Matrouh and Port Said. Each summer, we would travel to Port Said and Marsa Matrouh. As she moves across the memories, Magdy identifies two kinds of struggles for people who have lost someone: when a friend or loved one is known dead or when he is missing, or has lost his memory. The certainty, or lack thereof, makes a difference. In both cases though, the memories remain vivid. Magdy said that as she created and directed the play, it was very difficult to take charge of everything. She wrote the text, directed and acts in the play. She felt that the text was too personal to hire anyone else to perform. On the other hand, this is her first experience as a director—a process from which she learned a great deal. Being the director and an actress at the same time proved challenging. She observes that at times it was difficult for her to view the play from a distance, especially as the performance is infused with great personal detail and emotion. "It took me a while to recognize that I was distancing myself. It became clear to me as I [could see myself] hiding behind the jokes I tell, not to be deeply involved in what I say of my own memories," added Magdy, whose jokes drew laughter from the audience, even in the middle of such complicated and gloomy topics as memory and loss. As she performed she projected a unique ability to act out other characters and use her voice in a well studied, theatrical way. Her talent surfaces when she recites poetry or speaks prose in a sweet deep voice. She also incorporated short videos into the performance, blending them successfully with the one-woman show's pace. Magdy still believes that the script could be developed, and she is excited to perform again in Cairo. She says that she needs to arrange the financial resources first, as the budget she received for the project was all spent on the Cairo performance.